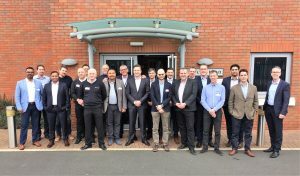 M Barnwell Services Darren Barnwell (Director) and Steve Bane (Purchasing) attended Precision Polymer Engineering’s EMEA Strategic Channel Partner Meeting at their HQ in Blackburn. At the two-day event, the M Barnwell Services team learnt more about IDEX’s new range of materials and products and their forthcoming strategies. M Barnwell Services are Precision Polymer Engineering (PPE / IDEX) Channel Partner for the UK. Precision Polymer Engineering (PPE / IDEX) have a specialist range of elastomers that M Barnwell Services can supply. These include Perlast®, Perlast® ICE, EnDura®, Dectectaseal®, Kimura® and Nanofluor®. For more information about this range contact a member of the team.